The 100% polyester pirate coat has a leather appearance and the collar, pockets, cuffs, and midsection are outlined in gold trim. A white lace-up shirt and black vest are attached to the coat. 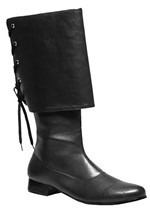 The polyester boot covers have a leather-like appearance that matches that of the coat. There is also a vinyl hat with a feather and a velvet sash with gold colored cords attached to it. This classy costume is perfect for any pirate. Accessorize with a sword (sold separately) and you’ll be ready to go!